The General Jeff Thompson Historical Marker is on the east side of the Pocahontas court square. For eye-witness reports on the capture of American Civil War General Jeff Thompson, nicknamed The Missouri Swamp Fox, in Pocahontas in 1863, just read the following two reports. The second one is particularly interesting, as it is the report of the Union officer who accepted Thompson’s sword in surrender. Expeditions from Cape Girardeau and Pilot Knob, Mo., to Pocahontas, Ark. Report of Colonel Richard G. Woodson, Third Missouri State Militia Cavalry. SIR: In obedience to orders from Colonel Livingston, of August 17th (he then commanding the post of Pilot Knob), I moved with a detachment of my regiment from this point on August 18th for Greenville, to form a junction with a battalion from Cape Girardeau. I arrived at Greenville at noon on the 20th, and had to remain there till the evening of the 21st for the troops from the Cape, when they joined me on the marching on Thursday, the 22nd. I moved with the whole force, about 600 strong, forPocahontas, by as rapid marches as the extreme heat of the weather and the condition of my stock would permit, and arrived at Pocahontas, Ark., on Saturday evening, August 24th. When I was within 4 miles of Pocahontas, I ascertained that Brigadier General Jeff Thompson was there with little or no forces. My column was then scattered over several miles, from the extreme rapidity of my march. Being very desirous to capture him, and knowing that I had to act with promptness or fail in that object, I ordered Captain [H. C.] Gentry, of the Second Missouri State Militia Cavalry, to move toward with all possible dispatch, with the advance, and surprise and capture the general, and that I would support him as soon as I could get the column up. Captain Gentry deserves the highest credit for this capture, it depending mainly, if not entirely, upon his promptness and efficiency in obeying my order move forward of the column and surprise him. I remained in Pocahontas about six hours. The St. Charles Hotel, on the east side of the Pocahontas town square, was built in 1853, and one of those ground floor rooms, above, served as headquarters for General Jeff Thompson during the Confederate occupation of Pocahontas. The hotel was later headquarters for the Union army when they occupied Pocahontas. Report of Captain Henry C. Gentry, Second Missouri State Militia Cavalry. CAPE GIRARDEAU, MO. Left on the morning of August 17th, marching by the way of Jackson and Dallas to Greenfield, Mo., where we arrived on the morning of the 19th, and reported to Colonel [R. G.] Woodson, of the Third Missouri State Militia Cavalry; the whole command marched south in the direction of Pocahontas, Ark., on the morning of the 20th; continuing our march, without molestation, until the morning of the 22nd, when we were informed of a protracted meeting being in progress some 20 miles north of Pocahontas, when I received orders to send forward 25 men to capture any of the enemy that might be there. I therefore ordered Lieutenant [J. H.] Burnett, of the First Missouri Volunteers, forward with the requisite number of his command, who surprised the meeting. In attempting to escape, 6 were killed and 1 was wounded, many of them having their arms with them, some of which were captured. Continuing our march, being in the advance, were informed by a contraband, at a mill 4 miles north of Pocahontas, that General Jeff Thompson and staff were at that time in the town, and a number of rebel soldiers were strolling about the place with their guns. I immediately informed the colonel of the fact, when I was ordered forward and “to catch him if I could.” The advance, consisting of 60 men of the First Missouri Volunteers, and not liking to delay for the others to come up, moved forward rapidly, finding horsemen on the road, who fled in the direction of Pocahontas; but owing to the superiority of our horses, they deemed it prudent “to hunt their holes” in the brush. “Yes,” says the general, “you are a prisoner yourself.” I then ordered him to hand over his dispatches, when he moved toward the door. The guard brought his “sharp” to bear on him; the general told him to fork over – it was no joke – when he handsomely came down with the papers, and seemed to realize his situation. We also had captured some 15 rebels soldiers. In the mean time Colonel Woodson arrived, when the prisoners were turned over. We remained in Pocahontas until midnight, when we resumed our march northward, having accomplished our mission, and arrived here in Cape Girardeau on this afternoon at 5 o’clock, without loss or accident. 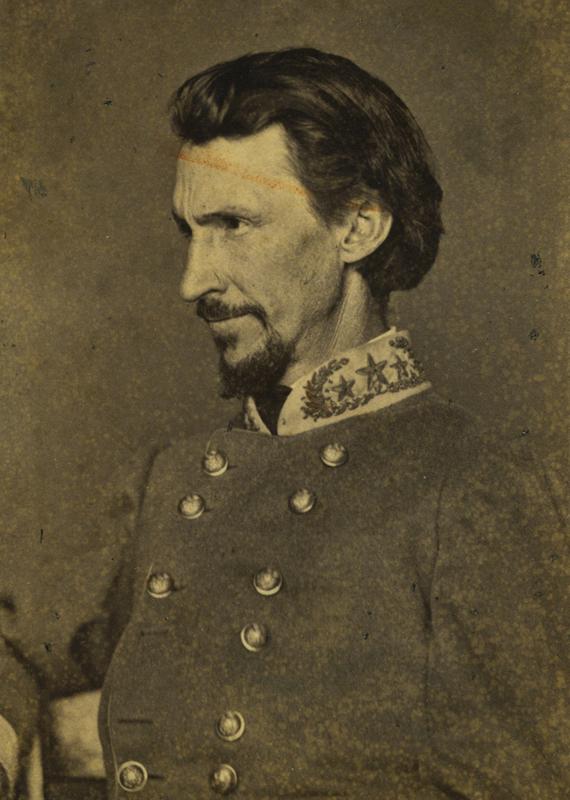 Colonel H. M. HILLER, Commanding Second Missouri State Militia Cavalry. Thompson was in a Union prisoner of war camp until he was freed in 1864 in a prisoner swap for a Union general. Thompson returned to the fight in Arkansas, finally surrendering his troops and laying down arms at the end of the war in 1865.